Prime Minister Narendra Modi expanded his Council of Ministers for the second time since 2014. Nineteen new Ministers of State (MoS) were inducted in the Union Council of Ministers. Besides, induction of these new ministers, Minister of State (MoS) Environment, Forests and Climate Change with independent charge, Prakash Javdekar was promoted to Cabinet rank. The Council of Ministers now has 77 members. The previous strength of the government was 63 (after Gopinath Munde died and Assam Chief Minister Sarbananda Sonowal and BJP Maharashta chief Rao Saheb Danve quit). Five ministers have resigned to make way for the new entrants as the council of ministers can have a maximum 82. 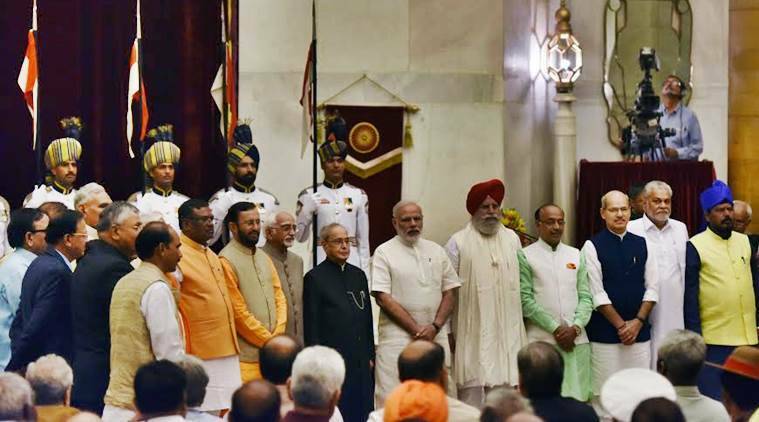 The Ministers of State inducted are : Faggan Singh Kulaste, SS Ahluwalia, Ramesh Chandappa Jigajinagi, Vijay Goel, Rajen Gohain, Anil Madhav Dave, Parshottam Rupala, MJ Akbar, Arjun Ram Meghwal, Jasvantsinh Bhabhor, Mahendra Nath Pandey, Ajay Tamta, Krishna Raj, Mansukh Mandaviya, CR Chaudhary, PP Chaudhary and Subhash Bhamre - all from the BJP - and Anupriya Singh Patel from the BJP's Uttar Pradesh ally Apna Dal and Ramdas Athawale of RPI. The ministers come from 10 states - Uttar Pradesh, Rajasthan, Gujarat, Bengal, Maharashtra, Madhya Pradesh, Delhi, Uttarakhand, Karnataka and Assam. There are three each from UP and Gujarat, and one from Uttarakhand while there is one Minister each from Assam, West Bengal, Karnataka and Uttarakhand. What does the Constitution say on the number of Ministers in a Cabinet? This means the Central government can accomodate up to 82 Ministers. This provision of constitutional cap for total number of Ministers in the Union Council was added by the 91st Constitutional Amendment Act, 2003. Anil Madhav Dave: Ministry of Environment, Forest and Climate Change (Independent Charge). Which of the following was the President of Constitution Assembly prior to Rajendra Prasad?